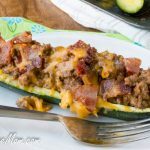 Bacon Cheeseburger Stuffed Zucchini Boats are the perfect low carb option when craving a cheeseburger! 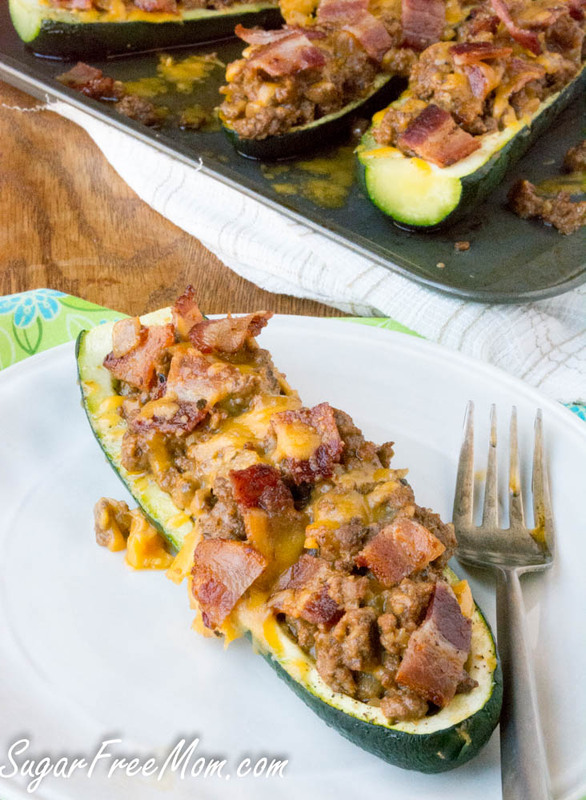 This low carb dinner can be on the table in 30 minutes! 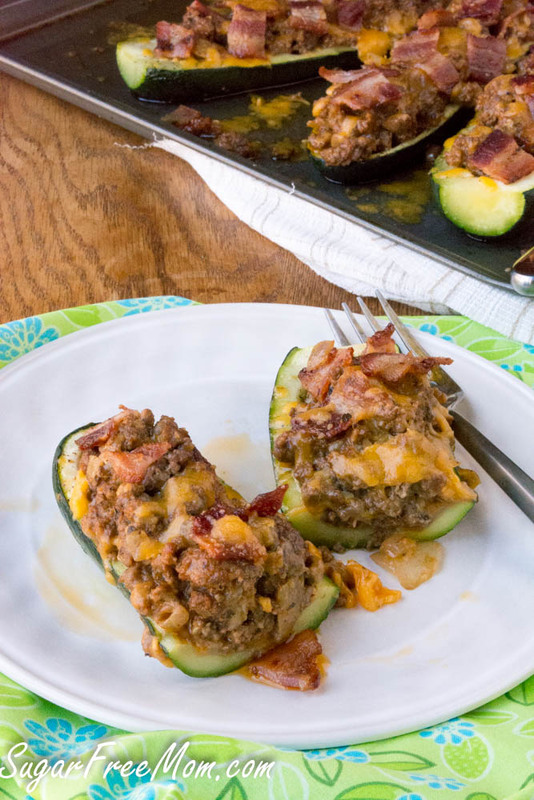 Whether you’re a fan of zucchini or not, the cheeseburger and bacon stuffed inside may change your mind. 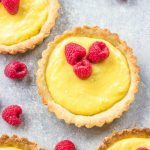 Or just use a fork and enjoy this amazingly delicious filling all on its own! 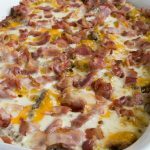 When you’re craving a cheeseburger and have no time to make any Low Carb Rolls, this is the best way to curb that craving and get some dinner on the table fast! I’m sure you must be wondering whether my kids will eat zucchini like this. So I knew that they wouldn’t, made this especially for hubby and I, made extra filling so the kids to enjoy it like tacos. All was good! If you have time you can use my Cauliflower Tortillas for tacos! 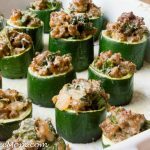 Zucchini’s will soon be in season and with it comes the constant influx of recipes using this awesome vegetable. 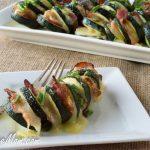 This is just one of those recipes for zucchini you should keep on hand for when time is tight or you just need a new idea with the abundance of zucchini you might be getting in your garden. This recipe is meant to taste everything like a cheeseburger so it’s definitely not meant to be low fat. In fact I hope all of you know by now that fat doesn’t make you fat, it’s not the enemy, carbs and sugar are. When fat is combined with carbs that’s a deadly combo. But fat with low carb is perfectly good for you and in fact the fat truly helps you feel satiated. I’ve been low carb for about 4 years and recently decided to go on the Keto diet. 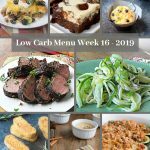 You can read about my 6 Week Keto Results here. It’s the lowest carbs in a day I ever thought I could handle, but with the higher daily fat intake it was easy and I never felt hungry even with reduced calories. So the motto is, don’t fear the fat, embrace it on a low carb diet! It’s quick. It’s delicious. It’s everything you love about a bacon cheeseburger without a bun. 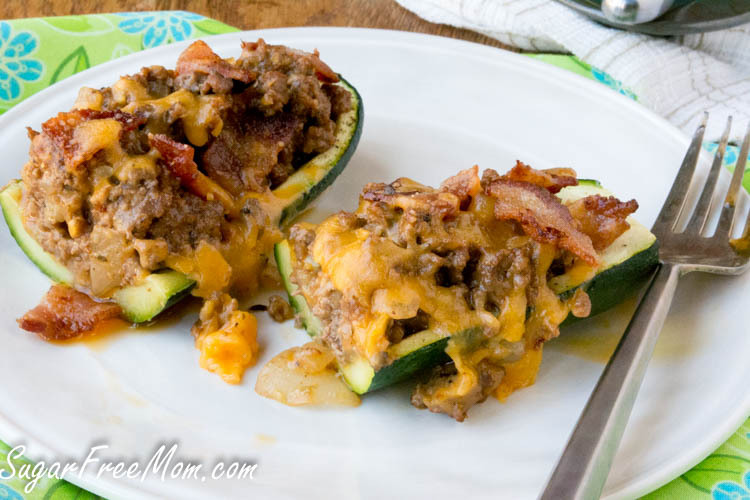 *****If you want to make this for your family, but you know the kids won’t like the zucchini or you feel like having a bun with this, double the filling ingredients here and use my Low Carb Cheddar Bun recipe! In a skillet, cook the bacon until crisp and set aside on a plate lined with paper towels. Chop into piece once cooled. Slice each zucchini lengthwise and scoop out the inside seeds, leaving about 1/4 inch from the sides. Place this removed insides of zucchini in a bowl and set aside. Rub the oil around the inside of each halved zucchini and place on a baking sheet pan. 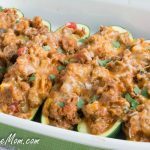 While the zucchini is baking you can make the filling. Remove some of the bacon grease from the skillet, leaving about a tablespoon or so in the pan. 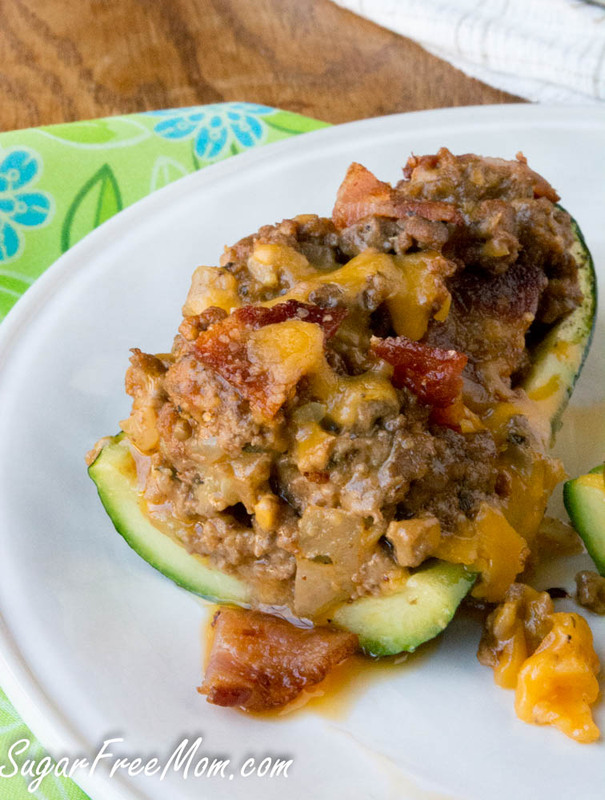 Cook the onion until softened then add the ground beef and insides of zucchini you had scooped out. Cook beef until browned then add seasonings, tomato paste, mustard and ketchup. Stir to combine the stir in 1/2 cup of the shredded cheese. Allow it to melt, turn off the heat and return half the bacon into the mixture. 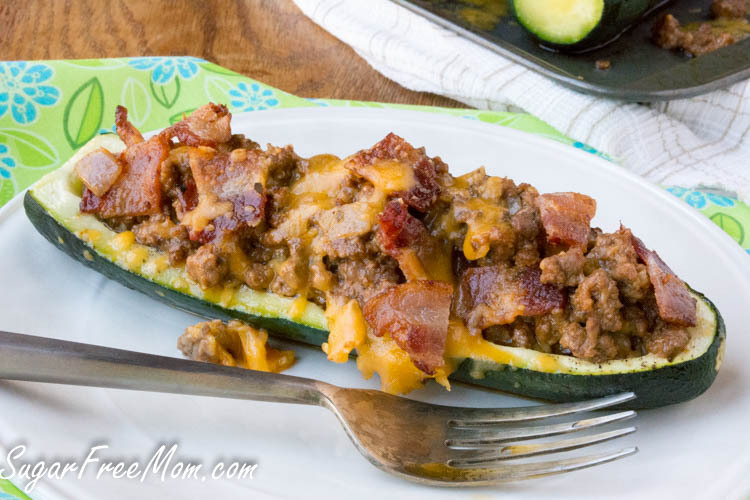 Once zucchini is cooked, remove from the oven and fill each half with the filling. Broil for 2 minutes to melt the cheese on top. Where does the 4 gams of sugar come from? 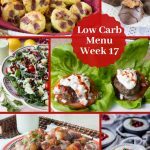 I’m so tired of my low carb burger in a lettuce wrap, this is a WAY better option! Love it! These look so good – so clever! 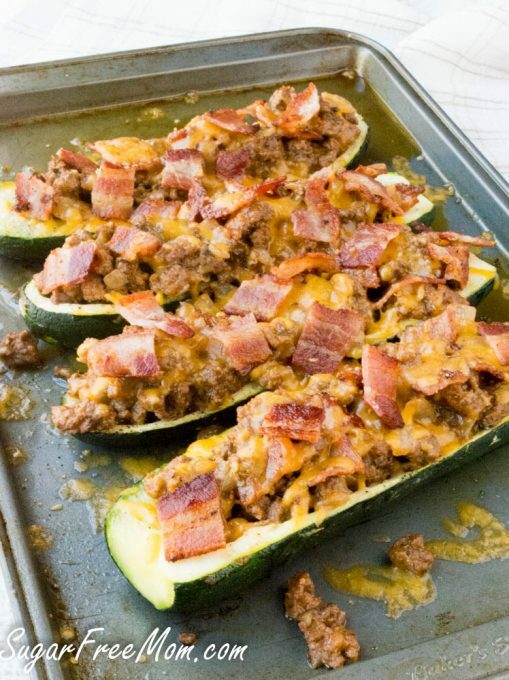 Not a person alive that wouldn’t love this – Great for my low carb dinners! 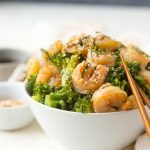 Yum!I could easily adapt this for Whole30! I made this for myself for dinner. The kids wanted waffles and I wanted something no-carb. WELL, they ended up eating their waffles AND helping me with my platter of cheeseburger boats! That was a fun surprise. I didn’t think they’d go for it. YAY! I tried this over the weekend and it is one of my favorites now. Thank you so much! If I want to prep this in advance, should I do all steps and then refrigerate prior to filling the zucchinis? And then broil all together? It doesn’t matter which side is up or down on the pan. Added fresh sautéed mushrooms. These are so good. We watch carbs so we now make this mix and use it as taco filling when we make our zero carb tortillas. A new favorite for sure! Made this Tuesday night for hubby and me. I made his with a yellow squash since he prefers them to zucchini they were delicious. I reheated one for dinner last night and was just as good if not better than the night before. 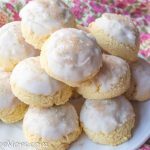 Thank you for your hard work on these recipies!!! I made these the other night. My Whole family LOVED them. My kids, ages 5 and 6, loved them. My daughter hates vegetables but loved this. Definitely making again. Glad you and the kids loved it! Add your inside scoop of the squash into your meat mixture! Sauté it with the ground beef! Delish! 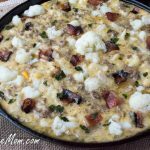 I do it every time add texture and flavor and veggies! Enjoy!